Official Summary: After ten years of blissful marriage, Navy Pilot Nate Chandler is divorcing his cheating husband. Single for the first time in years, Nate is numb to all emotion and kisses any chance of another relationship goodbye. 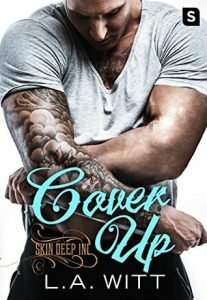 Review (add on Goodreads): Cover Up is the third book in the Skin Deep, Inc. series where Navy and Tattoo artists meet and fall in love. What I loved about Cover Up is that readers already know Nate and Lucas. They have both been in previous books. Granted, it’s okay if you start with this one because everything you must know about them is included here, like the fact that Nate is divorcing his husband after ten years for cheating on him (regularly) and that Lucas is much younger and yet twice divorced (from women). They meet when Nate goes to the tattoo shop to see about getting a matching tattoo he had done with his husband covered up. Of course, this first meeting leads to the two of them falling into bed with each other. Lucas is used to hook ups and he’s okay with that. Nate is more the one-man only type of guy but after his husband, he hadn’t felt attracted to anyone in awhile. Seeing Lucas and wanting him leads him to go with the flow and see what happens. Granted, this turns into more than a one night stand and soon the two of them are seeing each other as much as possible. Despite the age gap, I really liked the relationship between Nate and Lucas. Nate is reeling from a divorce, and he’s desperate to find a way to let him forget, but Lucas has been divorced twice already and knows that these things can take time. He doesn’t push Nate – until it’s really needed – and Nate is a sweet guy who tries to take care of Lucas too, like bringing him lunch at work since Lucas works three jobs. The couples from the previous books do appear in Cover Up, which I always love. It’s like getting mini sequels, allowing you to see where they are now in their relationship. Cover Up is definitely about taking chances and finding love again when your heart has been broken. I recommend all of these books! Official Summary (add on Goodreads): Andy Tyler has been the class daredevil since middle school. Over the years, he’s convinced his best friend, Jake Masterson, to perform some dangerous-looking stunts with him. But the dare they attempt on the night of their college graduation goes sideways. The firecrackers explode too soon and both of them end up with badly burned palms. Review: Five Dares has an interesting premise, I will admit, but I love friends to lovers romances so I had to check it out. I ended up really enjoying this one. Jake has been in love with Andy for years, but he hasn’t even come out to his friend. He wants things to stay the same and he’s afraid that if he does admit he likes guys, that’s one step closer to blurting out his feelings for Andy. Now – before you start wondering if this is a gay for you type of romance, it’s not. Yes, Andy does end up admitting his own feelings for Jake (shouldn’t be a spoiler; it’s a romance after all!) but he also states that he’s bisexual. I always appreciate characters that are bisexual too; it’s not always gay or straight, you know? More books should explore that aspect of sexuality. Looks like you had two great reads! Oh sounds like two good books. Thanks for sharing. Sounds like two great reads, the second one sounds like it’s even a little bit fun and not just romance! I’ve not heard of either of these so you’ve given me something new to add to the reading list. Also I’ve never read a book that explored bisexuality—I’m interested to! Didn’t know about Five Dares and that premise has me giggling a bit but I’m definitely getting that L.A. Witt one! The premise is a bit goofy for Five Dares, but it works somehow! LOL And yes, I love L.A. Witt. Oh both look good. The first really sounds sweet and I do love friends to romance books like the second one. I have to say you have made me more intrigued with Five Dares. These both sound like two sizzling reads!! These both sound like such good reads but it’s Cover Up that really catches my attention. The Navy aspect and the age difference aspect are both tropes I enjoy so I might have to pick this one up. Great reviews, Lauren!